DairyNZ’s effluent specialist Logan Bowler. Effluent storage and management is a risk area on any farm, and getting it right will both improve sustainability and add money to a farm’s bottom line, says DairyNZ effluent specialist Logan Bowler. He talked of t importance of adequately sized effluent storage and demonstrated the Dairy Effluent Storage Calculator, developed by Horizons Regional Council and Massey University, to farmers gathered at the NZ Effluent Expo Event on November 27-28. 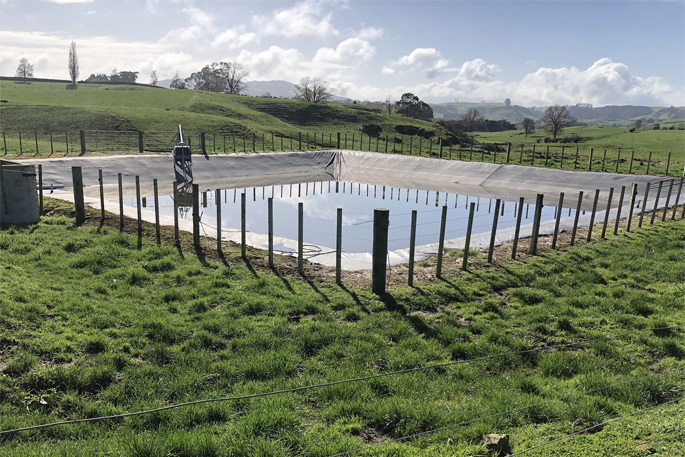 The DESC is available via free download from the DairyNZ website, and can be used to calculate new pond storage as well as learn the impacts of different inputs, says Logan. But there is a risk of farmers doing calculations themselves and making expensive mistakes by building incorrectly sized storage. “Most regional councils require a suitably qualified expert to complete the effluent storage calculation,” says Logan. Logan says water use, soil risk and application depth are the three most important variables in the DESC, and he took delegates through several scenarios with variations in these factors. The calculator works by looking at a variety of inputs including soil types, effluent catchment areas, feedpads, wash water, effluent irrigation depths, and the daily volume of effluent able to be irrigated. The DESC relies on 30 years of localised rainfall and evapotranspiration data, and while this data is accurate, it may not always reflect the reality at a particular property, says Logan. He encourages farmers to get good information about their rainfall patterns, and to choose the dataset in the DESC that most accurately reflects that reality. The old adage “garbage in, garbage out” very much applies to using the DESC too, says Logan. “The calculator is only as good as the data entered. Avoid costly mistakes by getting the data input right. Logan says small farms provide a unique challenge for effluent management, because the relationship between herd size and investment in effluent storage isn’t linear. In a separate presentation, he encouraged small farm owners to do the basics well when designing their effluent management systems. “It may be a worthwhile trade-off to have slightly higher running costs, and a significantly reduced capital cost,” says Logan. “It’s about investing where you will get the most value,” says Logan.